Safal yuva yuva Bharat- Youth campaign was held on 10th February at the historical Centenary Hall of Calcutta University . 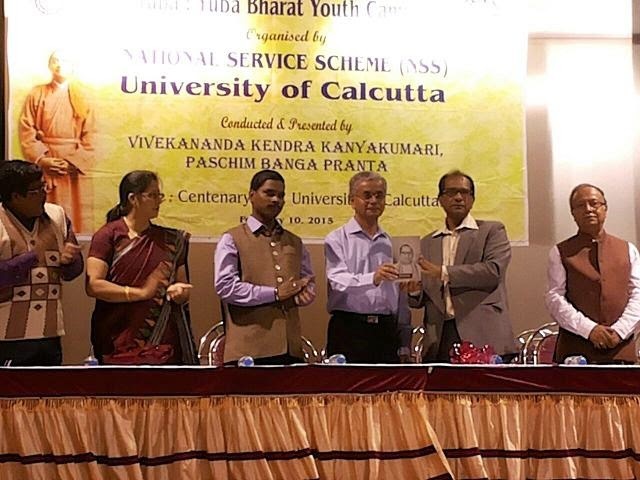 It was organized by Calcutta University, NSS group and conducted by Vivekananda Kendra Kolkata Mahanagar. The presence of nearly 1000 students and teachers representing 130 college units was a successful event as the participants showed eagerness for being a member of Vivekananda Youth Forum to be launched by Vivekananda Kendra Paschim Banga Pranta shortly. The team leaders showed their interest to organize similar such programmes for the students . The Vice Chancellor of Calcutta University Dr. Suranjan Das, Pro VC Dr. Dhrubajyoti Chatterjee, NSS Programme Officer Shri Samir Banerjee, Professor Radharaman Chakraborty ,Sah Sanchalak MEJSP, Paschim Banga Pranta, Shri Nirmalya Bhattacharya, Visesh Sampark Pramukh of MEJSP –PBP and Shri Manoj Das , Prant Sanghatak , Vivekananda Kendra Kanyakumari, Paschim Banga Prant were present in the inaugural session and delivered thought provoking messages. The day long programme covered games, meditation , power point presentation on How to achieve success in life and Kendra Parichay alongwith video clipping . The special attraction of the programme was the presentation of Shri Satyen Das, a young Richshaw puller who dared to visit Ladak by Rickshaw. With his will power and undaunted spirit he could achieve his goal which was appreciated and applauded by the participants attended the programme. It is a 2,500km journey that could unnerve even the most seasoned traveler — mountainous terrain, snow-covered tracks, killer weather and sub-zero temperatures. All this preceded by a grueling 2,000 km ride along the highways that connect Kolkata with the northernmost tip of the country. Now imagine doing it on a rickety rickshaw, running simply on will power. In total, he covered nearly 7,000 kilometers (4,440 miles) to be the first to accomplish the feat, which he hopes to have endorsed by Guinness World Records.